Making sure you get your pool opened properly is a great way to ensure that you have a great swimming pool season. We not only open the pool and de-winterize the equipment we also check over the equipment to ensure it is working properly. Equipment that is not functioning at 100% will only cause you problems throughout the season. We can remove your cover from your facility and store it at our warehouse facility. We will also clean it off and let it dry before long term storage. At the start of every season it is important to not only check the chlorine and pH but also the total alkalinity, calcium hardness, and cyanuric acid. These do not change as quickly as chlorine and pH but if they are not in balance your pool could go GREEN! Chemistry is a very important part of the pool triangle (Pool Triangle – Flow, Filtration, Chemistry), ignoring these other values would not be wise. 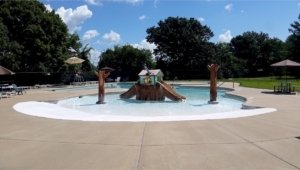 If your pool is just not looking that great and you want a professional to clean and balance it, we can do that. If you need us to bring out additional chemicals when we do the opening that is no problem. Please mention this at the time you setup your opening.